Our Hollywood Taxonomy series, which just turned 3 years old, is all about the pursuit of clarity through categorization — using box office data and critical reviews to sort through long, complicated filmographies. I’ve analyzed the careers of enormous figures in the entertainment industry, iconoclastic storytellers, revered actors, compelling comedians, bona fide phenomenons and also Adam Sandler. But, today, a series dedicated to understanding creative people and their careers faces its greatest challenge: the ineffable Nicolas Cage. I could claim that this article is timed to the release of Cage’s latest movie, “Mandy,” which recently premiered at Sundance, but that would be a lie. Pick any random weekend in the year and there’s a pretty good chance that a Cage film has been recently released or will soon be released. He puts out like four a year. I just thought it would be interesting to look at Cage’s work. This is the part of the piece where I give you my thesis. It helps to understand Sandler’s career if you bucket his films into three types, Vin Diesel’s into four. Cage, however, has made 73 kinds of movies — a few too many categories. But for my Crood ape brain, I must simplify. Like Cage, sometimes I had to make a serious reach. So here are the five types of Nicolas Cage movies. This is the core Cage movie — not too well received but not too bad either, and not blowing the doors off at the box office. These films are the weirder more independent movies that fly in the face of what a bankable actor would normally pursue. They tended to have lower budgets, got good-but-not-outstanding reviews (40 percent to 80 percent fresh on Rotten Tomatoes) and brought in less than $100 million, according to box office database The Numbers. It’s these 17 films2 that get at the heart of what Cage is: a worker. He enjoys being an actor. If given the opportunity to work, he’s gonna do it. Cage is on record as rejecting the idea that selectivity is the hallmark of a successful actor. I don’t really see the lie there. These are all serviceable movies — base hits, if you will. In 2004, Cage was paid $20 million to make “National Treasure.” A year later he made “Lord of War,” a film with a total budget of just twice that amount. It was a passion project, and he used the film to promote the work of Amnesty International. Personally, I think Cage’s decision as an A-lister to pursue weird little risky movies has legitimately hurt his career prospects. While other performers pursued franchises they can always return to, Cage, to some extent, has been galloping around Hollywood without that security. Take a look at the list of the 100 highest-grossing lead actors,3 and you’ll see Nicolas Cage at No. 24. He’s one of the most commercially successful actors of all time, but there two things that are particularly strange about how he did that. Who’s had the best career with the fewest sequels? Quick, name the protagonist of “National Treasure.” Prior to watching 73 Cage movies, I couldn’t. Most other big name stars are defined by at least one role — Wolverine, Hermione, Indiana Jones, Katniss Everdeen — and their challenge is to build a career outside of that role. Cage has no such defining franchise and no such defining role; his challenge is to make a role unique — and to build a career outside of being Nicolas Cage. Now we come to the heart of it: Cage has been in many, many enormously bad movies. All of the films in this category were rated 50 percent or less on Rotten Tomatoes and made less than $120 million in 2018 dollars. Remember, Cage is making a lot of bets — so he’s had plenty of opportunities to roll snake eyes. Still, I think that Cage’s work gets the short end of the stick on aggregated rating sites. Many, though not all, of these films aren’t really as bad as Rotten Tomatoes makes them out to be. It would be hard to prove this, but perhaps Cage’s work is uniquely prone to the trap of online averages. Rating sites algorithmically make polarizing films — ones that make strong if controversial choices — look like mediocre or bad films. But the take that Cage is a bad actor is a lazy one. It fails to account for why Cage’s choices stand out. When there’s a dissonance between his interpretation of the material and the directorial choices, you get scenes like the bees. Think about it: He’s giving a pretty true read of how a California Highway Patrol officer would react to being tortured with bees by a pagan cult prior to being sacrificed. If it looks ridiculous, that’s equally on the other choices being made at the directorial level that don’t set Cage’s dedication up for success. He’s the guy at the karaoke bar who is going absolutely all in on a Meatloaf song, but the music is an off-tempo midi file. In roles like this, I’ve come to think of Cage as a golfer who has one of the best drives in the game but is inevitably judged by his performances on miniature golf courses. When you act a lot and make big choices, sometimes they don’t work. Let’s talk about Cage’s recent work. The man has been making four movies a year every year since 2011. He’s the only person in Hollywood who makes Dwayne Johnson look lazy. Regrettably, most of them have sucked. All of these movies made essentially zero dollars at the box office. They’re video-on-demand movies, or they were targeted at the international market. An uncharitable analysis of Cage’s situation looks at the fact that he invested a high percentage of his assets into real estate immediately prior to the housing crisis and since then has had to unwind a number of investment properties at a loss in order to make good on some outstanding obligations. So, he’s been making any movie where the check doesn’t bounce in order to get back on an even financial keel. This is the narrative pushed by people attempting to dunk on Nic Cage. A far more charitable read is that Cage really does like to work, and he is getting older, so the slam-dunk leading man roles aren’t as common as they used to be. What’s more, his pivot to video-on-demand actually came ahead of the broader, Netflix-fueled industry shift that values unconventional release patterns and streaming distribution. As with most complicated things, the truth is likely somewhere in the middle. 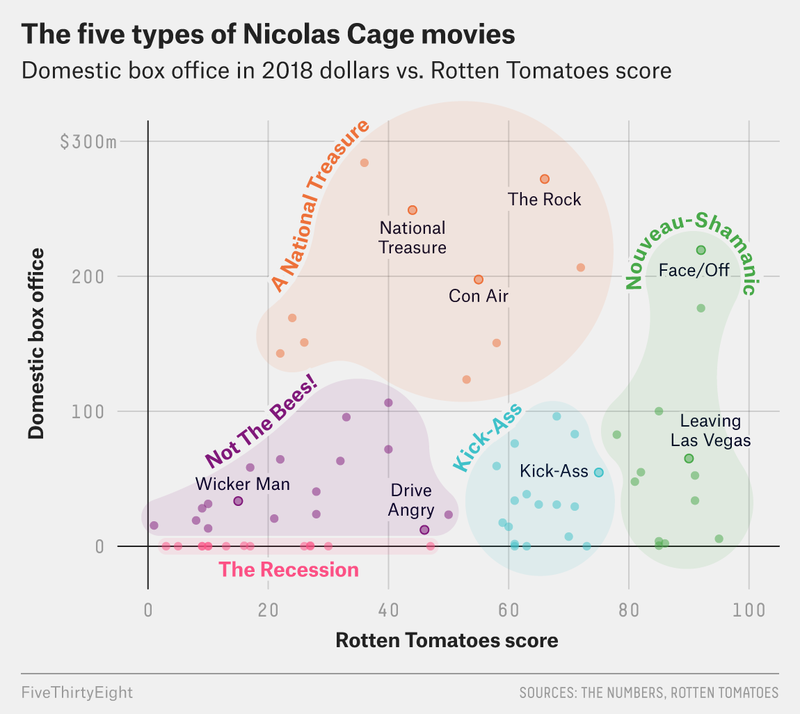 It’s here where I remind you that Cage has won an Oscar, and his core advantage and core flaw are the same thing: He is far less risk-averse than the rest of Hollywood. He’s a guy whom David Lynch called the “jazz musician of acting” and whom Ethan Hawke described as “the only actor since Marlon Brando that’s actually done anything new with the art of acting.” These movies are him at his peak — all are rated roughly 80 percent or higher on Rotten Tomatoes. In “Face/Off,” he plays a terrorist, and then an FBI agent who takes that terrorist’s face, and then the FBI agent who is pretending to be that terrorist. He can be hammy, but that takes a superb degree of restraint and craft. In “Adaptation,” he plays a pair of identical twins who act off each other and have distinctly different personalities. That got him an Oscar nomination. And, of course, in “Leaving Las Vegas,” he plays a broken man experiencing the entire spectrum of professional and personal collapse, from flame out to cirrhotic suicide. I think we all agree that that’s pretty weird, but if pursuing a trance-like state to get into character is what works, then freaking do it, Nic. His range alone bears out the success of his methods. Cage has more in common with Meryl Streep — who also has a flair for accents, an Oscar pedigree and her share of bold misses — than he does with other leading men, many of whom settle into a type. Looking at the list of box office stars who have made the most money from movies based on an original screenplay — the people who make a living outside of adapted franchises — Cage comes in ninth, with $1.7 billion derived from 45 original screenplay films. Set aside the “Star Wars” trio and he’s sixth, behind only Adam Sandler, Tom Hanks, Ben Stiller, Will Ferrell and Robert De Niro. All of those guys have a type: Adam Sandler the manchild, Tom Hanks the decent fella, Ben Stiller the affable straight man, Will Ferrell the screamer and Robert De Niro the tough guy. Cage is not that easy. He’s played a lot of cops and soldiers, but I don’t think anybody really has him pegged as a Tommy Lee Jones-style lawman. He’s played as many superheroes as Chris Evans,7 but he’s not a comic book character. He was hot and in some of the biggest hits of the past 30 years, but never once was he the top star at the box office. Cage plays a cop who avenges a victim of a vicious assault and kidnaps a businessman's brother for ransom. In the end, he parachutes into Las Vegas with Elvis impersonators to win the love back. John Malkovich costars. Cage plays a reformed mobster who tries to settle an enormous debt and spends the second world war in a love triangle. In the end, he reconciles with his wife after leaving prison. Directed by Brett Ratner. Cage plays an arms dealer who robs a vault full of diamonds and tries to exterminate the human race. In the end, he is a hero helicopter pilot. Directed by David Lynch. Like Ben Mendelsohn’s character in “Knowing,” you are going to have serious questions about my sanity. For what it’s worth, I’ve written about actors who had made fewer movies in their entire careers than appear in this category alone. That’s according to aggregate domestic box office gross. He just edges out Robert de Niro, who has had 69 starring roles in his career. De Niro, though, had a 10-year head start — his first starring role was in 1973, according to The Numbers, while Cage’s was in 1983. “Bad Lieutenant: Port of Call New Orleans” is merely a spiritual sequel. The only person in Cage’s elite tier who’s more averse to sequels — by both raw number and as a percentage of total work — is No. 26 Leonardo DiCaprio, who oddly enough has not once appeared in a sequel. But Leo’s been in far fewer films than Nic. I enjoy that he loves Ghost Rider so much he had to cover up his Ghost Rider tattoo in order to play Ghost Rider the two times he played Ghost Rider.